Considering the hundreds of thousands of outdoors-lovers in and around Denver, it should come as no surprise that there is an endless array of parks and trails within a 90-minute drive from the state capital. This includes Arapaho, Roosevelt, and Pike National Forests; more than a dozen state parks; the impressive Denver Mountain Parks system; and upwards of a hundred county parks. Many offer decent day-hike options. The downside? Crushing crowds…particularly on weekends during the summer months. 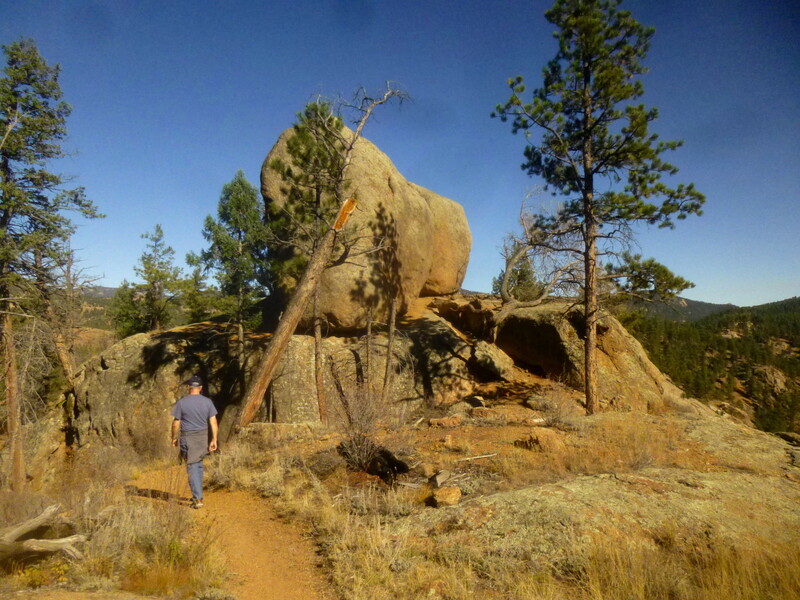 Yet a relatively quiet alternative to the heavily-trafficked parks around Golden, Morrison, or Evergreen can be found slightly further afield in Pine Valley Ranch Park, around an hour southwest of Denver by way of the pretty town of Conifer. 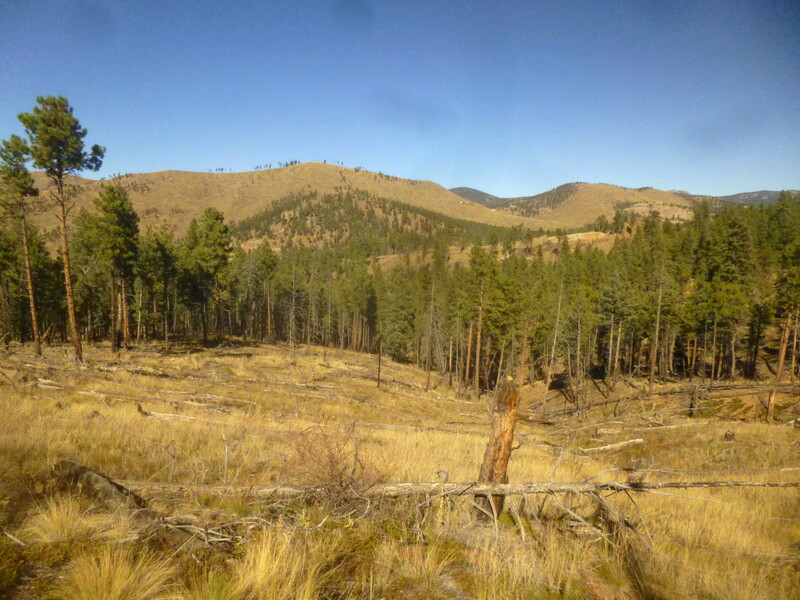 Once the private property of early 20th century Chicago business magnate William A. Baehr, Pine Valley Ranch is now one of the 30 local parks administered by Jefferson County. 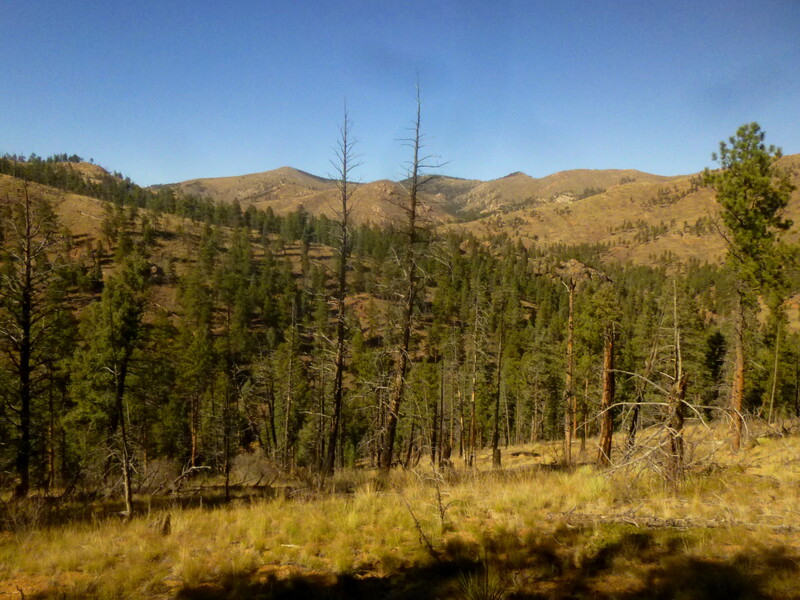 The short 2.1-mile Buck Gulch-Strawberry Jack-Park View loop, climbing 500 feet to sweeping views of Pine Valley and the Front Range, is perhaps the most interesting hike in the park. 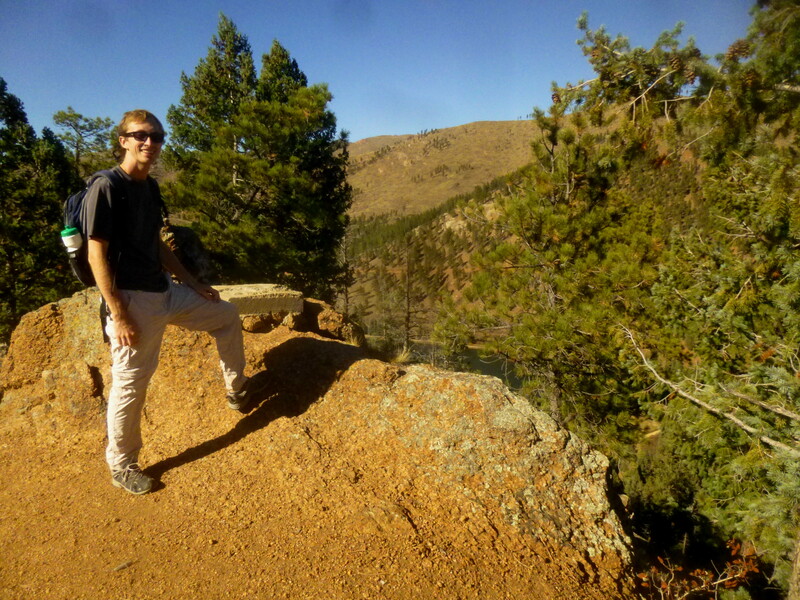 The hike, which I would rate as “moderate” difficulty, can be completed in as little as an hour. 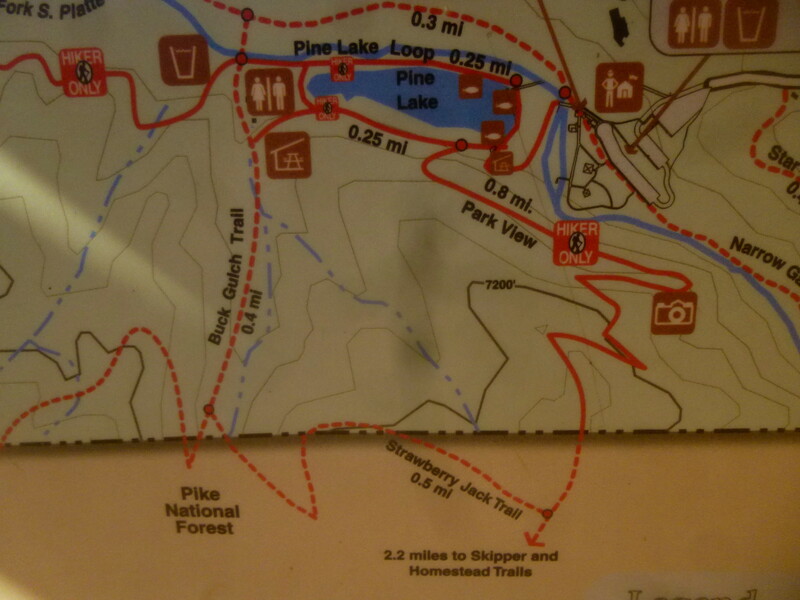 As the hike explained here is a roughly two-mile loop, you can follow it one of two ways. 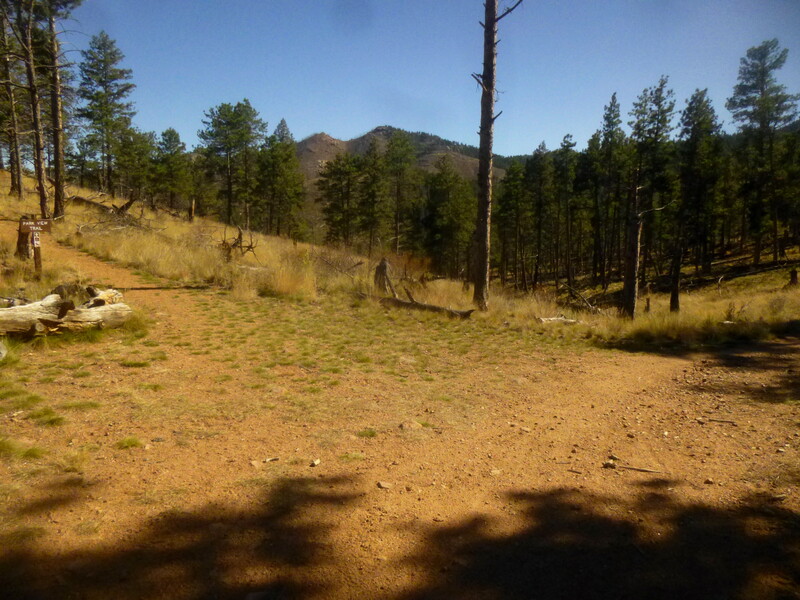 The first involves a relatively gradual but steady climb through scattered thickets of ponderosa pines up to around 7,350 feet, via Buck Gulch and the Strawberry Jack Trails. 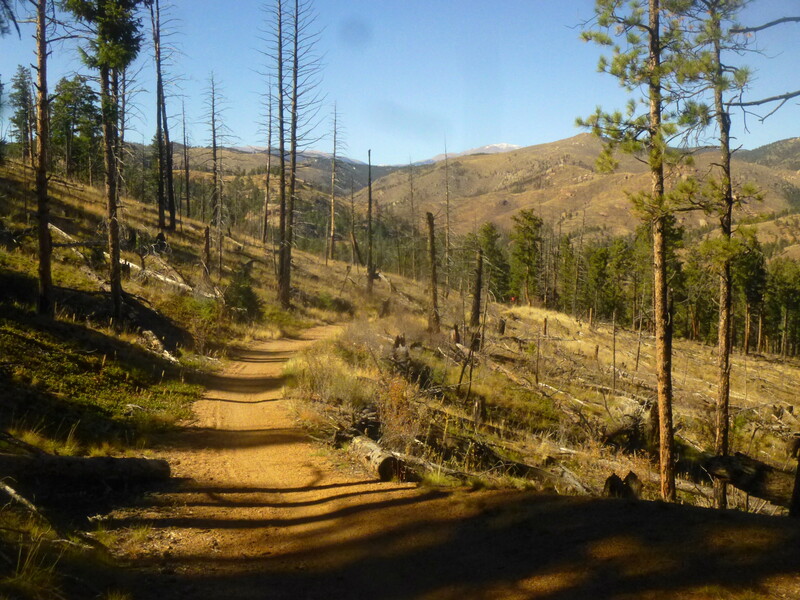 The reverse route requires a headlong ascent up the Park View Trail, covering a 500-foot elevation gain over the course of 0.8 miles. Considering both the obvious logic (degree of difficulty) and my preference for saving the most dramatic section (the Park View trail) for last, I recommend the former. 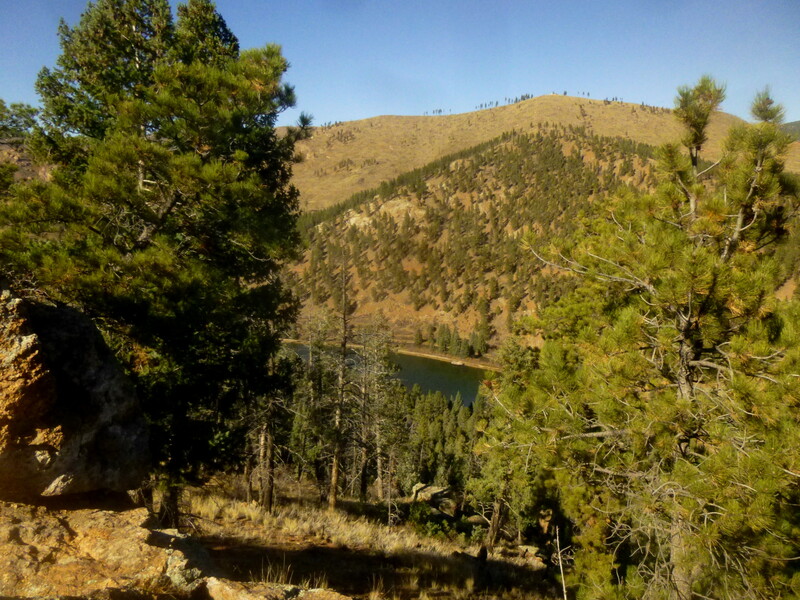 Begin by following the wide, tightly-packed dirt trail indicating “Pine Lake Loop” for about 1/10 mile (crossing to the west side of the South Platte) until reaching, you guessed it, Pine Lake. Then follow the southern bank of Pine Lake for maybe 300 yards, at which point you will enter an open clearing with restrooms. Here there should be a sign indicating “Buck Gulch Trail.” Take a left here, following the well-established trail for another 100 yards to Buck Gulch. (Evidently around here lie the ruins of an old chimney, yet I cannot recall seeing it.) After another left, the trail ascends roughly 150 feet over 0.3 mi., crisscrossing a seasonal stream that is more likely than not to be dry. In fact, it does not take long to notice how everything looks dry and a bit barren – vegetation, though ubiquitous, is not at all densely-packed. This is due in part to the relative lack of rain in this corner of the Front Range, yet it is hard to miss the damage wrought by humans: the 2000 Hi Meadow Fire, sparked by a discarded cigarette in nearby Bailey, burned through nearly 11,000 acres of land, including much of Pine Valley Ranch Park and neighboring Buffalo Creek Recreation Area. 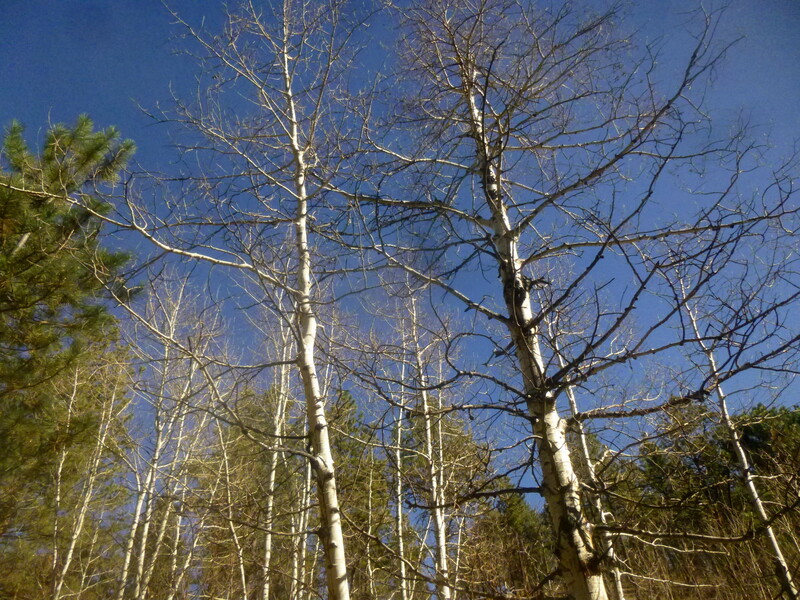 A number of the park’s pines survived—and new growth has begun to overtake the old, particularly down in Buck Gulch—but entire swathes of dead trees abound. 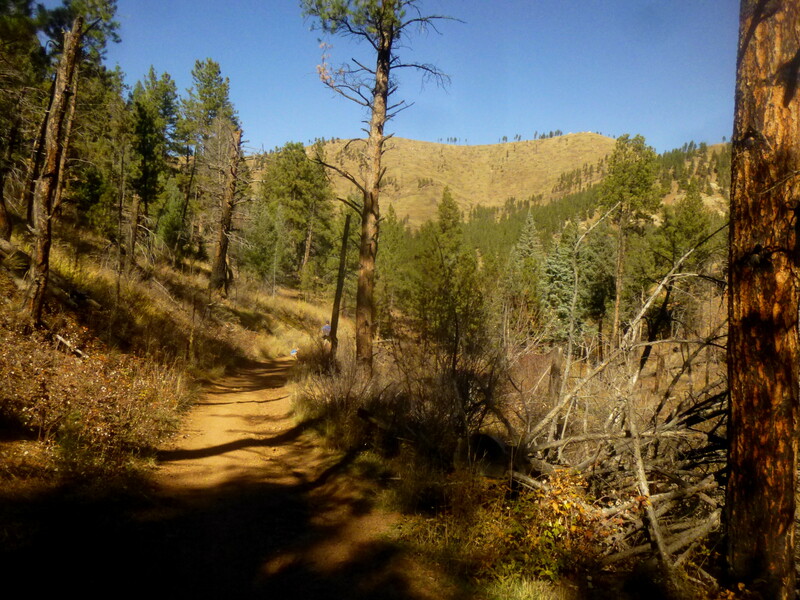 Now roughly 0.7 miles from the trailhead (and a world away in terms of crowds and terrain), the Buck Gulch Trail crosses out of the park and into Pike National Forest. 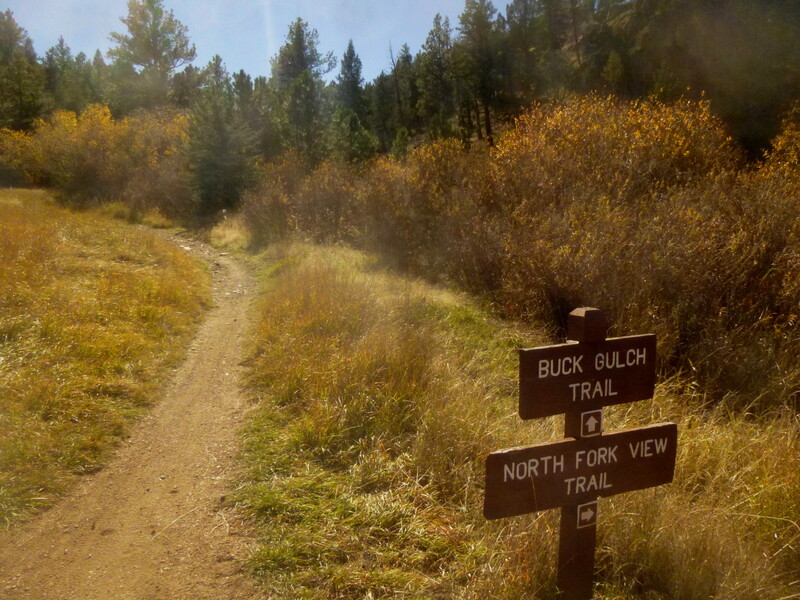 Here the path splits: to the right, the Buck Gulch Trail continues to climb for another 2.5 miles through Buffalo Creek Recreation Area. 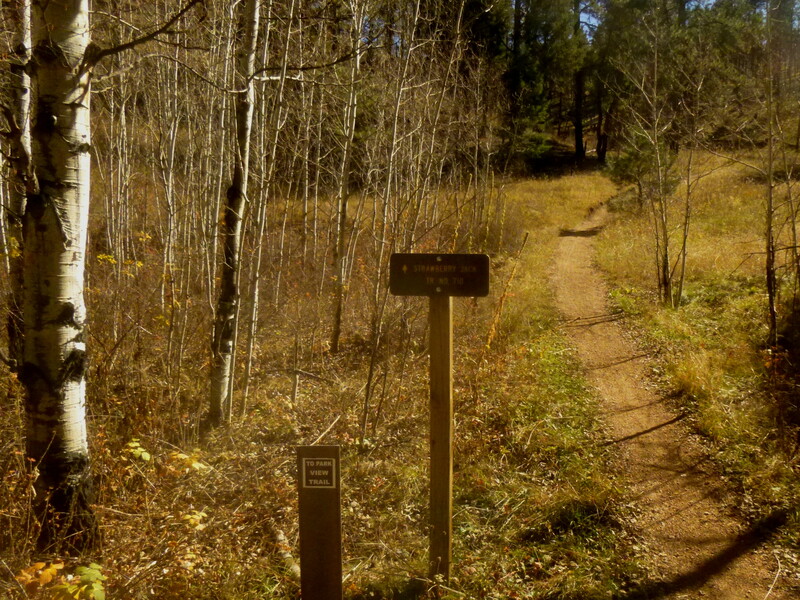 To the left, situated next to a small aspen grove, the Strawberry Jack Trail begins. Both are popular with local mountain bikers (though there are more than a few hairy hills and trenches I would not want to maneuver à vélo)…on a nice day, you can expect to see several riders along the way. 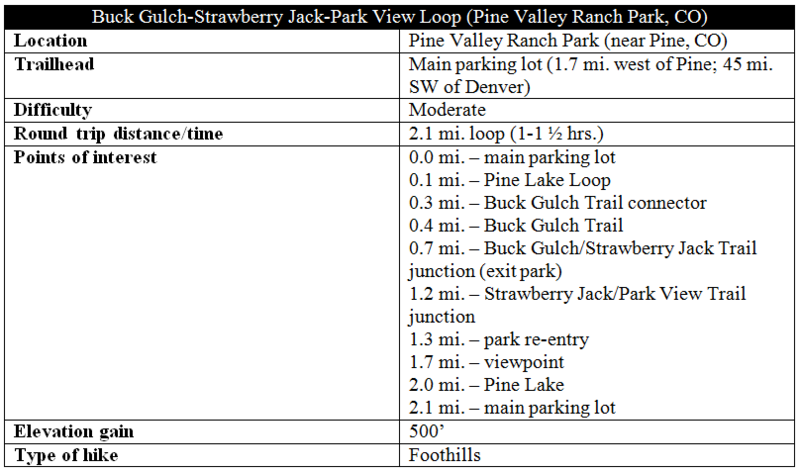 The Strawberry Jack Trail is noticeably steeper than the route through Buck Gulch (climbing around 350 feet in 0.5 miles), but not unbearably so. The wide, dusty path climbs steadily through a small gulch before abruptly switching back and skirting north around an unnamed ridge. Because of the dearth of trees after the 2000 fire, much of this section is exposed, the silver lining being better-than-average views, at this altitude, of the surrounding mountains. As the trail edges around the ridge, the often-snowcapped peaks of Mount Logan (12,870’) and Rosalie Peak (13,575’) come into view off to the northwest. 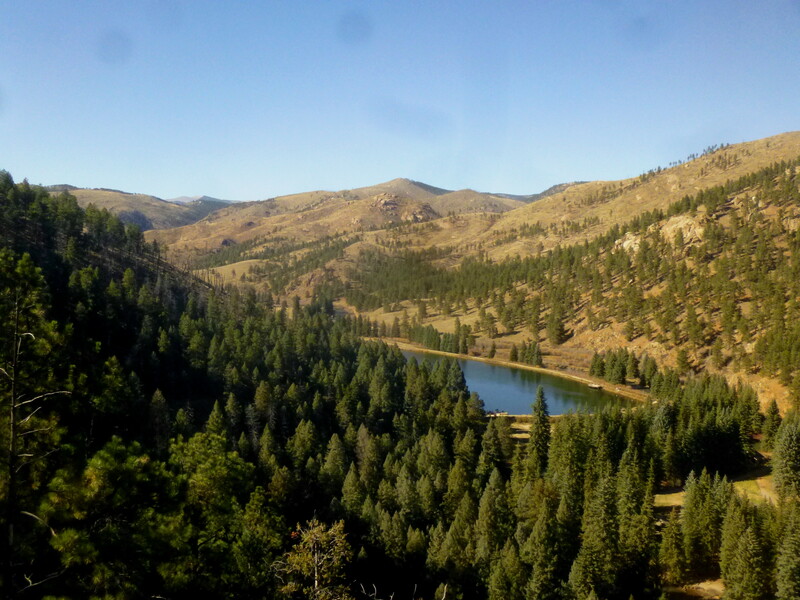 To the north, enjoy views of the upper reaches of Pine Valley, including the 7,900-foot peak directly across the river. The rolling, yellow-brown peaks of this region remind me of the aureate hills of the Marin district north of San Francisco—except dotted with ponderosa pines. 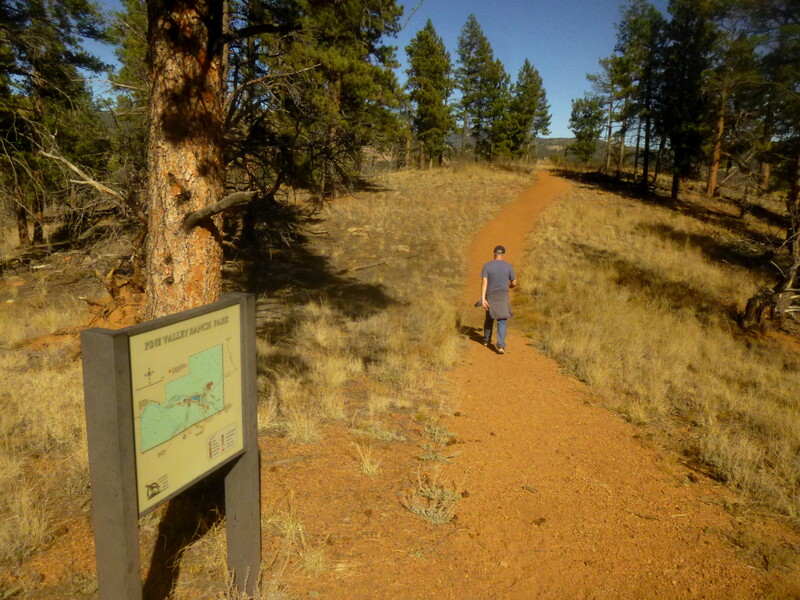 After ½ mile, the Strawberry Jack Trail crests the ridge and brings hikers within striking distance of the highest point on the loop (7,350’)—the exact point is located 20-30 yards up the Park View Trail, which begins here. 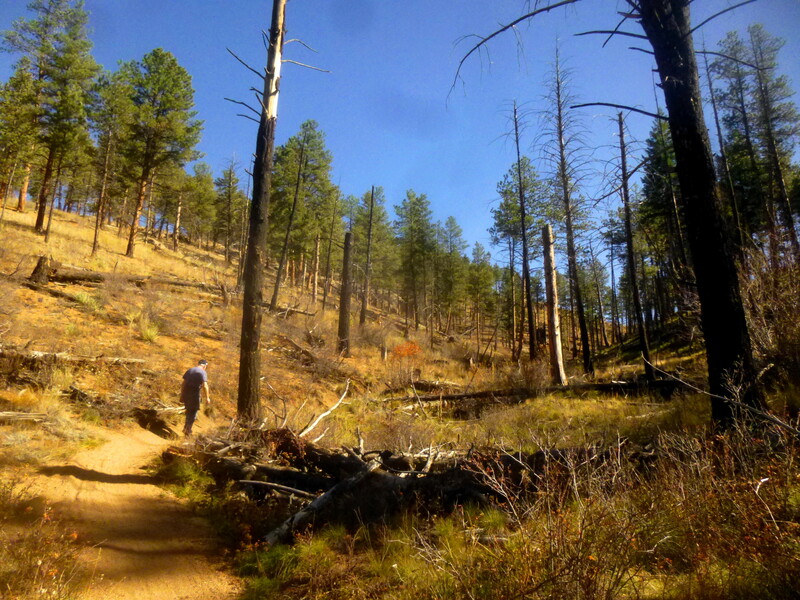 Off to the right, the Strawberry Jack Trail continues 3.5 miles into Pike National Forest. 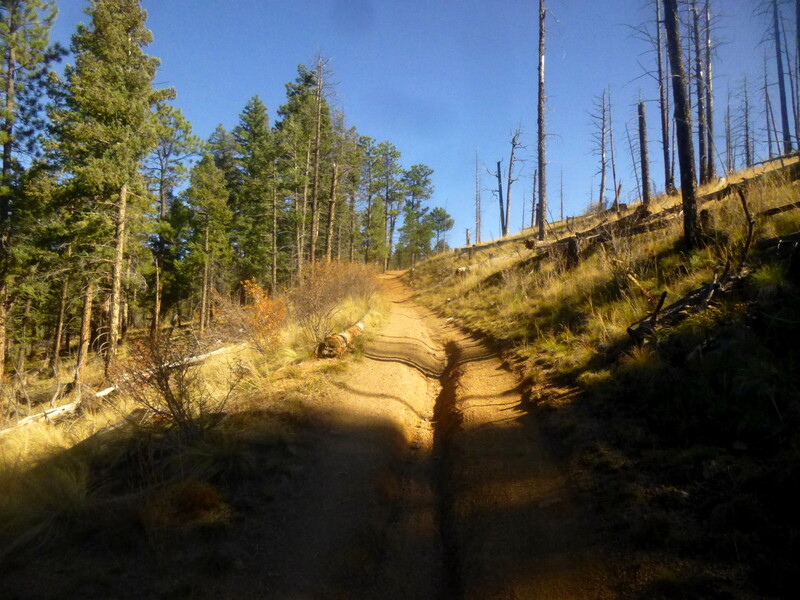 Unless you are up for a 7-mile loop that covers all of Strawberry Jack and returns via Buck Gulch, take a left here. The Park View Trail is essentially 0.8 miles of mouth-watering vistas, beginning with a series of rock outcroppings that offer more views of Mount Logan and Rosalie Peak to the northwest. After about 200 yards following the top of the ridge, a sign and map indicates that you have re-entered Pine Valley Ranch Park. Another 0.2 miles beyond brings hikers to the precipice of a rocky viewpoint, accessed via a short spur trail off to the left. 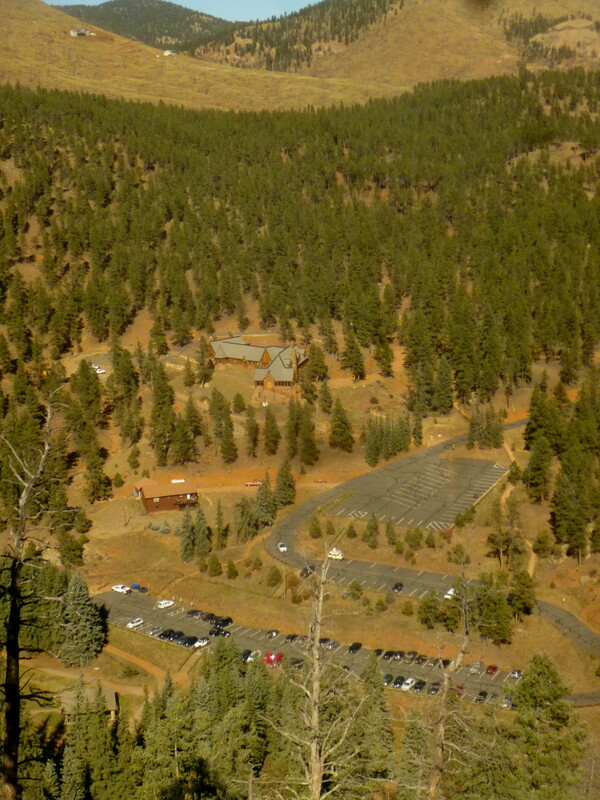 Looking down 500 feet from this spot, check out the bird’s eye view of Pine Lake, as well as Baehrden lodge and the main parking area. Rejoining the main trail, the route immediately begins to descend sharply to the east, bringing the eastern portion of Pine Valley, as well as the rocky protrusion of Banner Peak (8,445’), into sight. The narrow dirt path now switchbacks west, and then again east, before hitting two great viewpoints. A collection of massive boulders (visible from down below in the parking area) marks the second overlook, as well as the beginning of the final steep stretch winding down to the west toward Pine Lake. 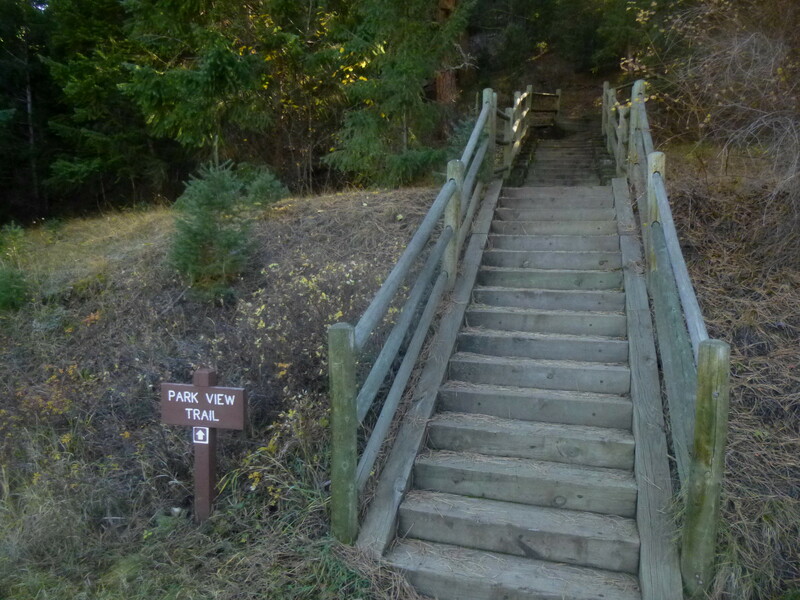 The final section of the Park View Trail is well-maintained, with steps, guardrails, and stone-carved overlooks. With the sun tucked behind the mountains, this area is likely to be shady, and therefore significantly cooler than, say, the exposed Strawberry Jack Trail. 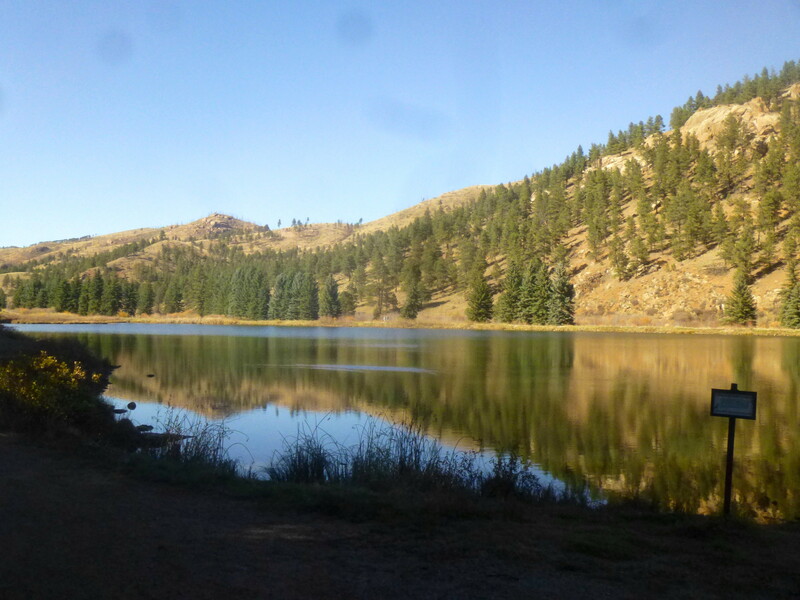 All the while, enjoy views of Pine Lake, which gradually grows closer and closer. 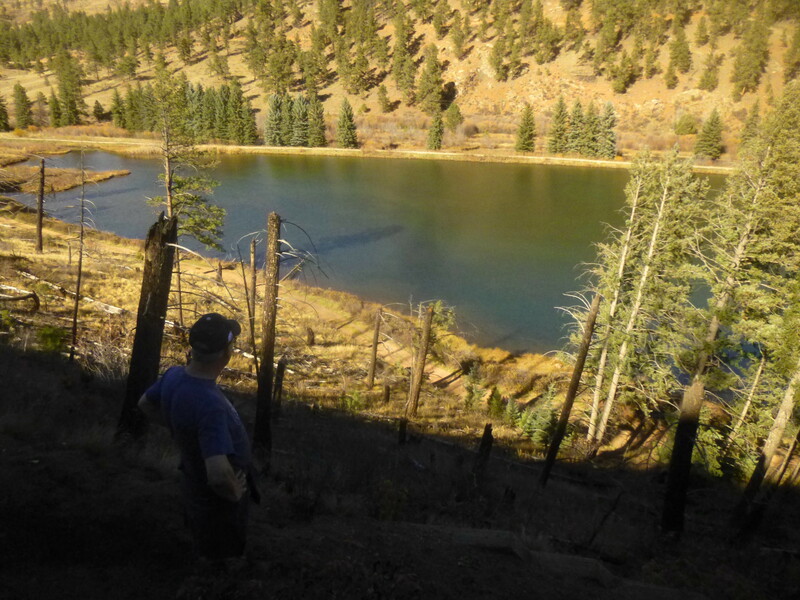 At the final switchback, less than 1/10 mile from the end of the Park View Trail, the view of the reservoir is virtually unobstructed (due to the dead vegetation). 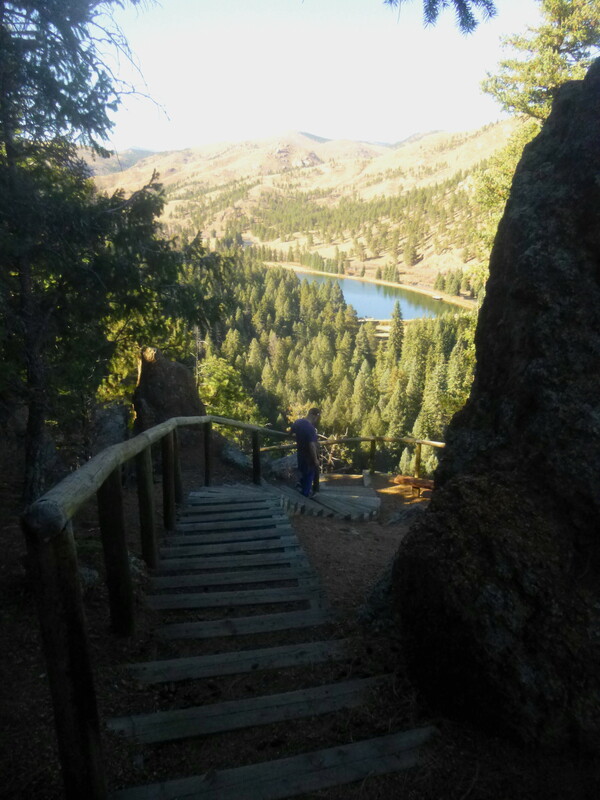 A final staircase descends through the trees and one emerges back onto the wide, flat, and crowded Pine Lake Loop. 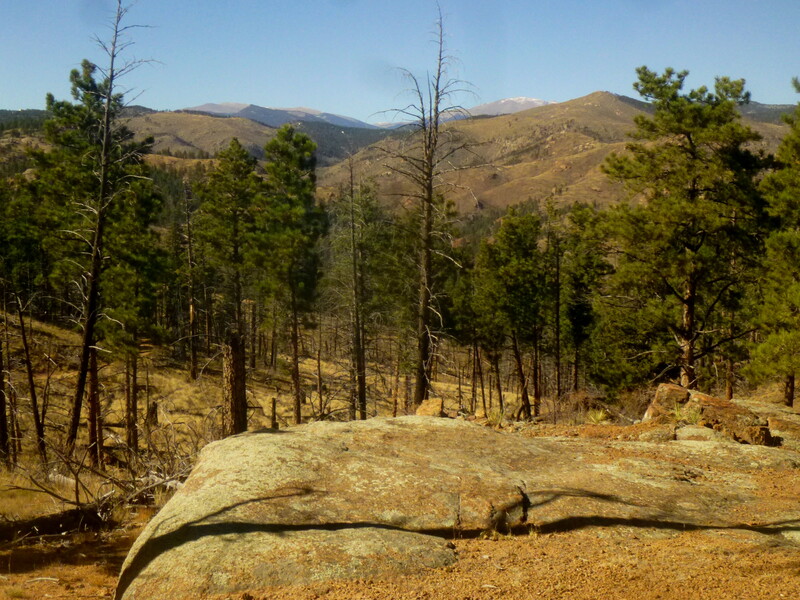 From here, retrace the 1/10 mile or so back over the South Platte to the ranger station and main parking lot. 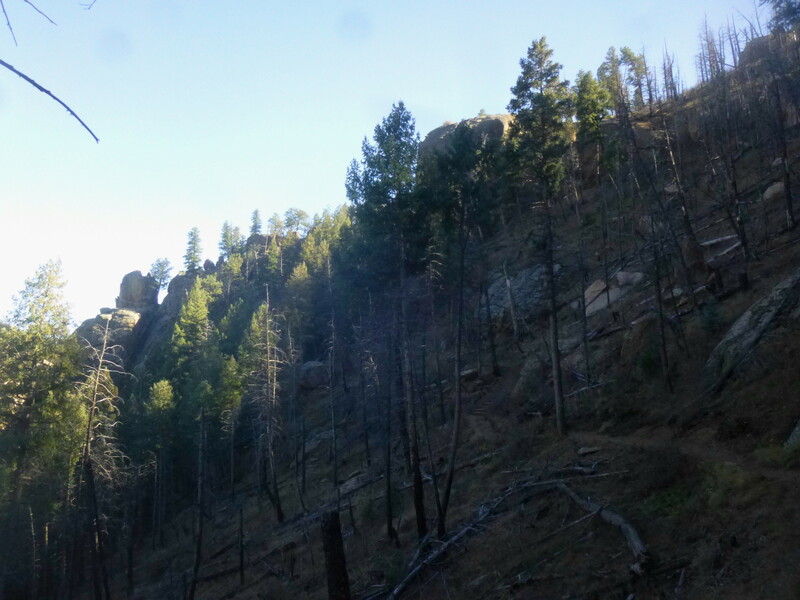 Take a look back at the canyon wall to the south; it is easy to spot the monolithic stones from whence the trail came. Further afield: Want to keep walking? 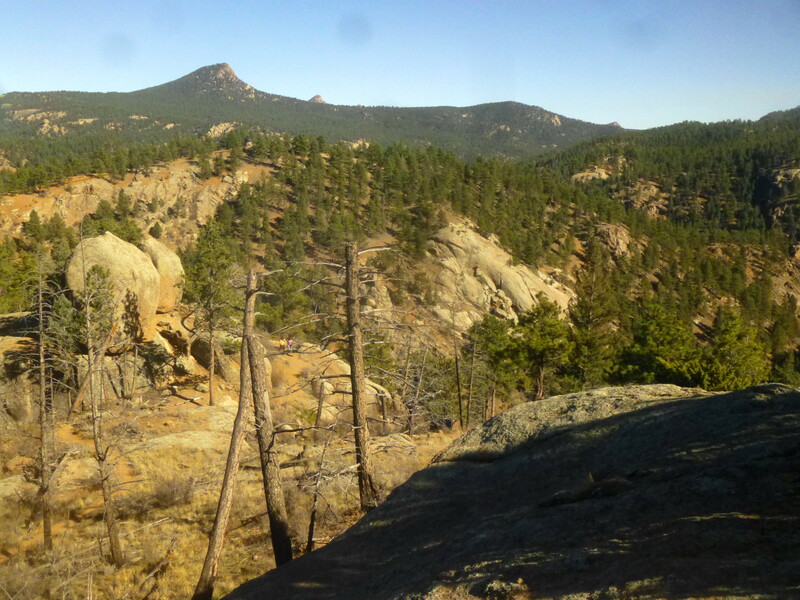 Try the pleasant Narrow Gauge Trail, which also begins and ends at the main parking lot, for a 2-mile stroll along the beautiful North Fork of the South Platte River. See detailed trail description here. 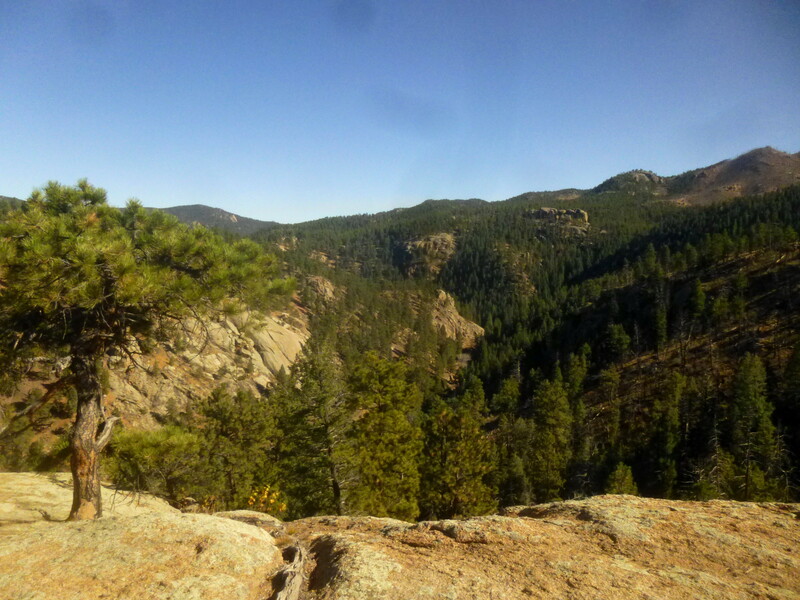 This entry was posted in Colorado, Jefferson County Parks, Moderate Hikes and tagged Buck Gulch Trail, canyon, Colorado, Denver, Hi Meadow Fire, lake, loop hike, Park View Trail, Pike National Forest, Pine Lake, Pine Valley, Pine Valley Ranch Park, Strawberry Jack Trail. Bookmark the permalink.